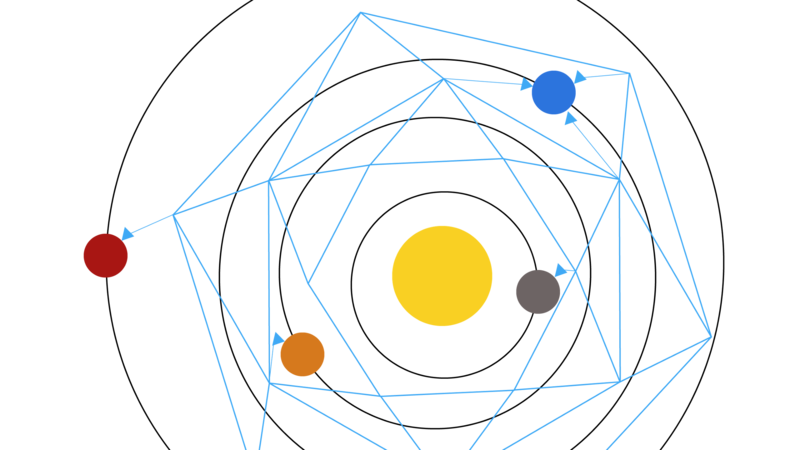 Diagram depicting a schematic representation of a mesh network with maneuverable communication nodes spread in between planets orbits within the inner solar system. Large blue lines depict the communications between main communications nodes. Triangles are planetary communications satellites to bridge ground to space communications. In practice, this may require many, many more communications nodes in order to account for interference by random particles and space dust. Not to scale. Artwork by yours truly. I was up until early this morning, unable to sleep, pulsing with some energy I couldn’t quite pinpoint. So I do what I always do in situations like that and turned to Facebook. I wasn’t the only one up early into the morning, some of my friends in the Pacific Northwest were also up frustrated and wondering why they were so awake. I scroll some more. He wasn’t interested in the time delays, but rather what would a realistic implementation look like. My mind buzzed around a little bit before lighting a flame — ignition for launching a workable idea. Not too long ago there was a publication demonstrating Quantum Secure Direct Communication (QSDC), which uses two entangled pairs of photons, two quantum memory elements for storing a quantum state to interact with, and a direct line of sight for transferring half of the two entangled pairs of photons to the other side. Through some fun math and timing tricks it’s able to transfer data using the entanglement. If any of the photons for the entangled pairs becomes intercepted, it ruins the communication. 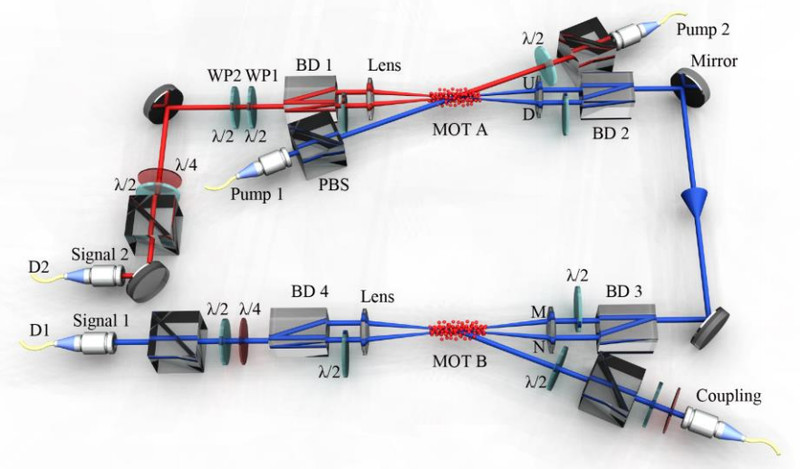 Experimental Setup For Quantum Secure Direct Communication. Diagram mercilessly screenshot from . While we are a ways away from having a completely working version of this for any distance, since they admit they haven’t demonstrated the full protocol in their paper . In about 10 years or so, we’ll probably have the technology for launching a mesh networked version of this between the Earth and the Moon. As decades go by, perhaps the rest of the solar system will get the internet. If these could be laid out in a way that allows bidirectional communication we’d have a pretty fast, secure communications network. Set up satellites orbiting a few planets so that there’s always line of sight between multiple planets. In this case, there would be a varying latency for communication, as the planets are always moving in relation to one another. Sometimes, it could take a very long time to relay data, but it might still be slightly better than our current situation where we can only send or receive data at certain times of the year. Create a distributed network of communications stations which hold their position in space between planetary orbits. This would take more effort and energy to keep these stations in place given all the constantly shifting gravitational and tidal forces in the solar system. However, it could also mean higher bandwidth communications since this would most likely be modular like current antenna towers here on Earth and could allow adding additional relay units. If this is organized like a mesh spread out in between planetary orbits, it could provide good connectivity throughout the solar system. If done properly, latency would vary less than bouncing signals off satellites orbiting around planets since the longest path would be a few static hops between communications stations. The bandwidth would vary as a function of interference (decoherence of sent photons interacting with particles in space, or atmosphere in the case of planetary satellite to ground relay nodes) and how many parallel quantum links exist between the two points in the network. While either of those options would be a few energy levels above our current situation, why stop there? I started imagining how we could improve this further. What if it were technically possible to store pairs of entangled photons separated by vast amounts of distance over a long time frame without decoherence? Would it be possible to implement a protocol using those stored entangled photons and a signal over the quantum network relay to initiate communication in real time using those pre-distributed photons? Could it be possible to have real-time communications between two locations separated by a large distance after a signal is sent (limited by the speed of light + repeater latency) to initiate the communications protocol? Imagine being on Mars, giving a presentation at a conference on Earth with real time audio and video (or VR even). All it might possibly require is a sufficient amount of planning to store separated entangled photon pairs in both locations and proper timing of a signal to initiate the protocol a suitable time before the presentation. This means we’d still experience a delay, but it would only happen before the stream starts — like a sort of quantum buffering. Of course, this is my imagination running wild. Science will still have see if it’s even possible. An illustration of the relative sizes of orbits of objects in the solar system. Image courtesy of NASA. The most optimal operation of this network is within a solar system. In the most efficient case of network design, signaling across the solar system takes approximately 8 hours. Since we’d need to place satellites above and below our orbital plane in order to get past the asteroid belt, it would probably take longer for a signal to propagate. Since the orbits get even larger past Jupiter, the network topology would need many more repeaters than anything in the inner solar system. Communicating between solar systems is still very time and resource intensive. 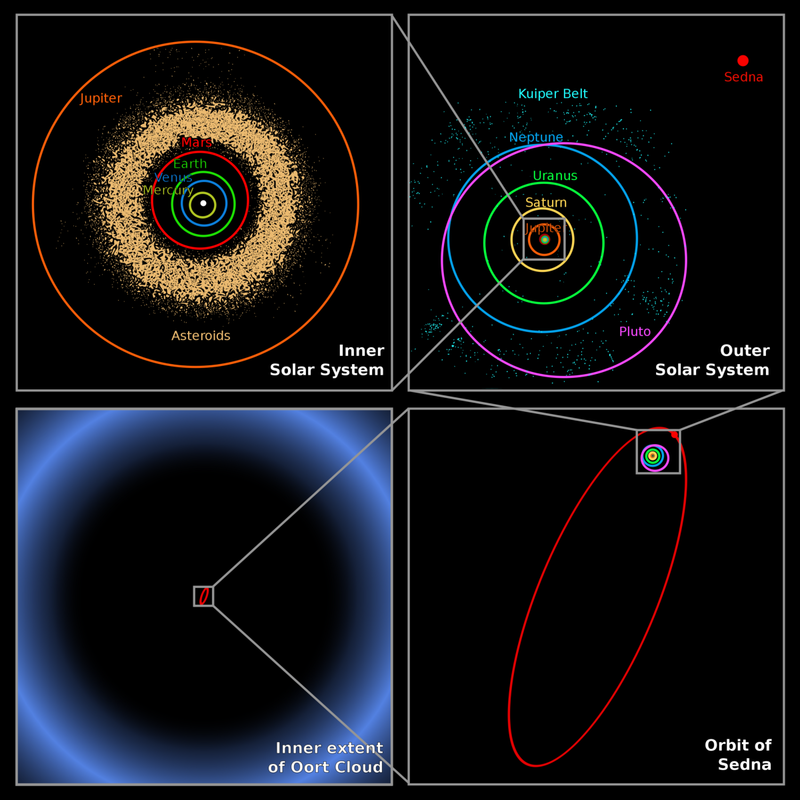 Let’s take Tau Ceti and the most recently discovered super-earths as an example. It would take a very long time to establish communications with the solar system. Even after the possibly several centuries it would take to set up the communications network, it would take 12 years to send a message one way. Assuming my crazy imaginative idea holds, it might be possible to generate enough entangled pairs of photons and store them on board a ship to leap frog communications. However, one would need a complex network of quantum repeaters which could be left behind the ship and it would still take approximately 12 years to transfer entangled photon pairs to that system alone. Maybe there’s a way to add parallelism to the distribution of entanglement, but perhaps that would only double the efficiency. Then you’d still need to send a signal 12 years earlier to start the process of communicating though the buffered entangled photon pairs. Until (and if ever) all this happens, your great-great-great-great-great-great-grandchildren can fathom what it would be like to have to plan a video conference 12 years in advance. Zang, Wei, Dong-Sheng Ding, Yu-Bo Sheng, Lan Zhou, Bao-Sen Shi, and Guang-Can Guo. “Quantum Secure Direct Communication with Quantum Memory.” Physical Review Letters 118, no. 22 (May 2017). https://journals.aps.org/prl/abstract/10.1103/PhysRevLett.118.220501 [also available at https://arxiv.org/abs/1609.09184].